Daughter of Wilhelm Friedrich von Schadow and Charlotte von Groschke. Her father became Director of the Academy of Art in Düsseldorf in 1826. She grew up among artists and Felix Mendelssohn-Bartholdy lived under their roof for a few years. Her father taught her painting and Wolfgang Müller von Königswinter (1816-1873) taught her poetry. In 1845 she married the physician Richard Hasenclever, who was also an artist and a politician. Afther their children were born she remained in the background for twenty years, but she worked on poems and translations. In later years she had a literary salon that was visited by Karl Immermann, Ferdinand Hiller and Robert and Clara Schumann. In the 1870s she started to publish. She translated works from the French and the Italian, among them a translation of Dante's "Commedia Divina" in 1890. 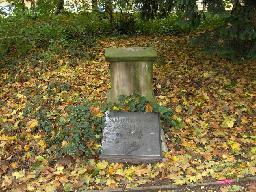 The grave of Richard Hasenclever and Sophie Hasenclever-Schadow at the Golzheimer Friedhof in Düsseldorf.